10 x 12 Shed - Who Has The Best? 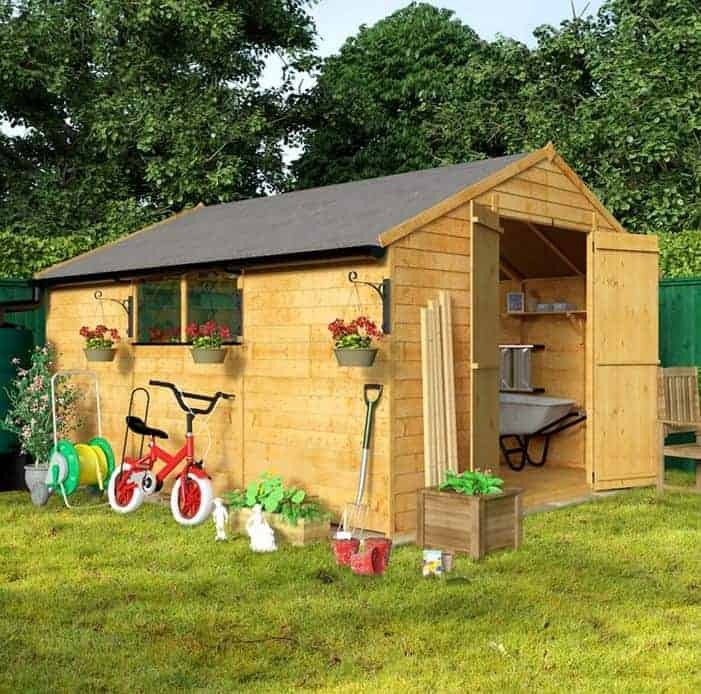 A 10 x 12 shed can be an invaluable addition to any garden, as it offers a large storage space and yet doesn’t take up too much space from the garden itself. Traditionally made of timber, they can now also be found in metal and plastic substrates, and each have their own benefits to offer the consumer. Because of their accommodating size 10 x 12 sheds also have lots of versatility, meaning that they can be not only a generously proportioned storage facility, but also a place to relax in the garden whatever the weather, or even a workshop for business or leisure. There are lots of sheds available in this increasingly popular size, which is why WhatShed have created this guide to help you find the very best 10 x 12 shed available to buy online in the UK today. Just what did we look for, then, when selecting the 20 best 10 x 12 sheds? Money and value for money were primary concerns of course, but we also considered the design and appearance of the shed, and any features that made it stand out from the crowd. 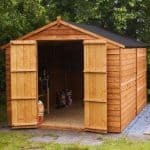 Our list contains sheds to suit all budgets, and has wooden, metal and plastic sheds. Choosing the very best 10 x 12 shed was no easy task, so congratulations to the Yardmaster shiplap shed with floor support kit which took the top place in our league table of the best 10 x 12 sheds that can be bought online in the UK today. Whether you’re looking for large sheds or workshops, a compact security shed, or any kind of garden building at all, WhatShed will bring you the detailed and independent reviews that can help you make a wise purchase. 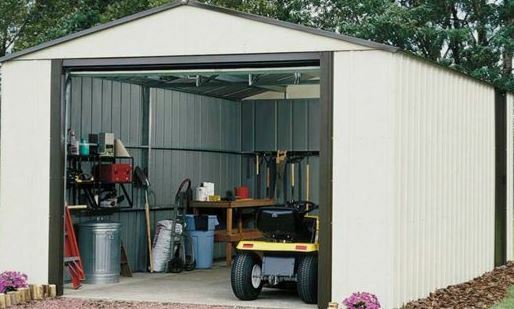 The number one 10 x 12 shed in our guide goes to a metal shed from Yardmaster that provides excellent value for money as well as an additional feature that lifts it above competing metal sheds. We were impressed with this shed at first sight, thanks to it’s subtle green colour used across all the cladding, which makes a difference from the dark green and white cladding that we often see on the metal sheds we review. That’s not all that we liked about the cladding as it also comes with a 12 year guarantee from the manufacturer, and as it won’t rot or rust and doesn’t need to be painted it’s a maintenance free garden building as well. 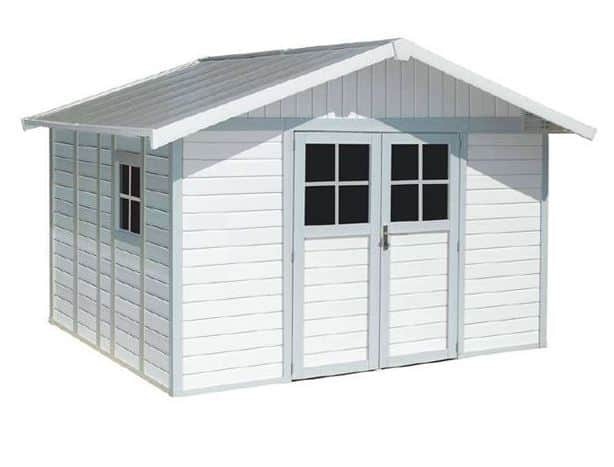 The feature which elevates this above other metal sheds of a similar size is that whilst it still offers very good value for money it comes with a floor support kit as standard. Metal sheds are typically screwed directly onto a flat concrete surface, but that can lead to a cold interior in winter, as well as problems with dusting. The floor support kit allows wooden floorboards to easily be installed, and as they’re then elevated above surface level there’s no need to worry about ground moisture. It’s a value adding feature that takes this attractive window free 10 x 12 shed to the top of our rankings. We’ve reviewed lots of Absco sheds, and it’s easy to see why this Australian brand is now gaining a big reputation here in the UK as well. This is a perfect example of what they do best, and whilst its metallic colouring, or zincallume as Absco refer to it, may not be to everyone’s taste it certainly deserves looking at by people who are wanting a 10 x 12 shed that’s very affordable, easy to install and maintain, and very durable too. 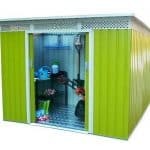 The thing that makes this metal 10 x 12 shed different from any other in our top 20 list is that it utilises a patented snaptite assembly system. As the name suggests the individual pieces of metal cladding snap firmly into a supporting frame, and this makes the installation very swift and simple, even for people who’ve never tried to assemble a mid sized shed before. Once fully assembled the shed feels very strong and secure, and in fact it has been tested to withstand winds in excess of 90 miles per hour in Australia. It’s also very rain resistant, and is helped in this by the pitch of the apex roof. Added confidence is provided in the shape of a 20 year guarantee, and it’s only the, for some, too metallic appearance that prevents this taking the number one spot. When it comes to mid to large sized garden buildings such as the 10 x 12 shed we often find that timber models typically cost more than their metal counterparts. Nevertheless we know that a lot of people prefer the classic look of a wooden shed, and we’ve taken this into consideration as well when determining the order of our league table. 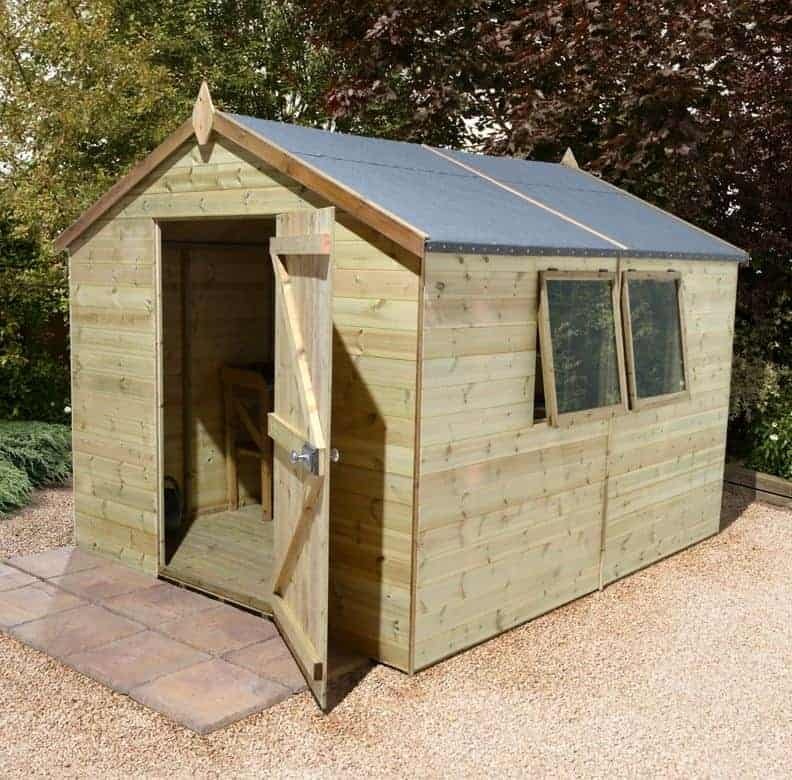 That’s why this particular shed takes the bronze medal position and in the process becomes the highest ranked of the wooden 10 x 12 sheds we’ve reviewed. It’s very strong and durable, and yet for a good looking timber shed we also feel it represents good value for money. The first thing that struck us about this shed is that it’s a little taller than average, and that means not only that there’s more storage space but also that there’s more room to move around in which creates a pleasant environment to spend time in. There’s lots of light inside as well thanks to six tough windows, meaning that this would be a great choice as a workshop where natural light can be so important. We were pleased to see as well that the tongue and groove cladding used throughout has been pressure treated, which isn’t something we always find on a reasonably priced wooden 10 x 12 shed. This also means that a long 15 year warranty is provided against rot. Metal sheds can be much more attractive than many people think, as well as being very practical thanks to their longevity and lack of maintenance requirements. Those are just some of the reasons why this 10 x 12 shed from Arrow, a leading name from the United States, makes it into our top five; we were struck by the brown colour scheme used on the cladding, arranged in an overlap design that simply channels rainwater away and ensures that the contents within are kept dry. This is a function carried out by the black apex roof as well, which is also important in the fight against corrosion. The galvanised steel used for the cladding is very tough and rigid, despite being relatively lightweight and therefore easy to assemble. A mark of just how durable the cladding is is shown by the 15 year no perforation warranty, which we welcomed as a sign of just how confident Woodvale are in their product. We’re confident in it too, which is why with a price tag of under six hundred pounds and double sliding doors that make it easy to transport objects in or out of storage we feel this is a 10 x 12 shed that deserves to be on anyone’s short list. Metal 10 x 12 sheds have dominated the upper reaches of our league table, and that’s because they often provide a winning combination of an affordable price and a high quality and reliable garden building. 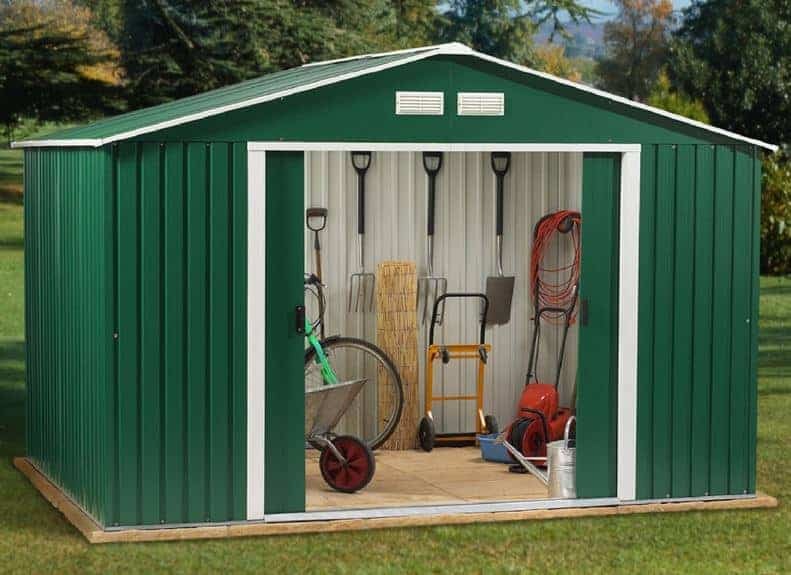 One other advantage that a metal shed such as this brings is that it’s virtually maintenance free, other than a clean up or hose down from time to time, as they don’t need painting, staining, or treating with preservative and they won’t rot. The durability of this shed isn’t totally conveyed by its 10 year warranty as we feel it could last a lot longer without any rust or perforations appearing. We found this quite an attractive metals shed as well, as we liked the unique shade of green it employs, almost akin to British racing green, with contrasting white details around the vents and double doors. This inbuilt ventilation is very useful, as not only does it keep the interior cooler on a hot day it can also prevent the build up of condensation. One unique feature we really liked about this shed is that it features an entrance and exit ramp that folds out from the sliding double doors. This makes it very easy to move even heavy or bulky items in and out and this is one of the reasons we rate this 10 x 12 shed so highly. 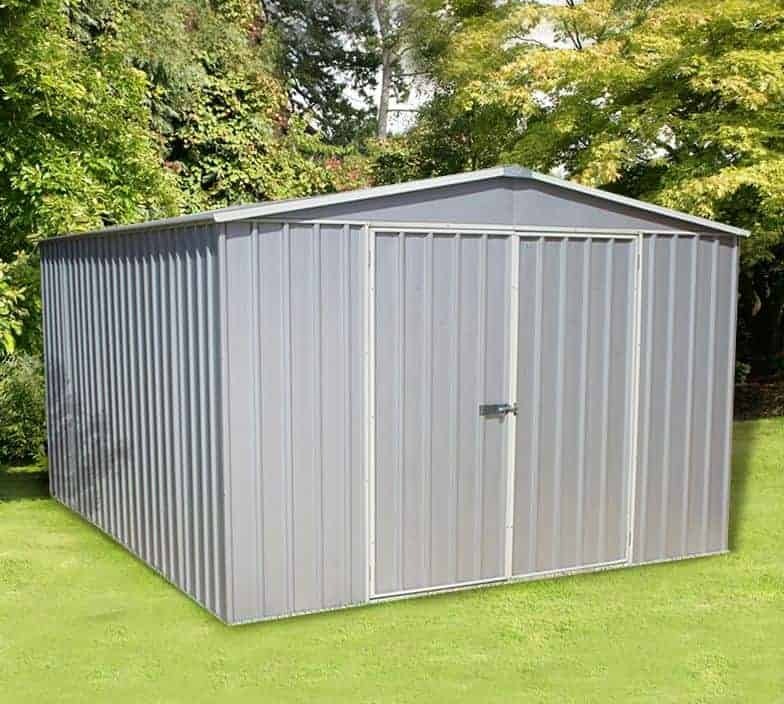 Whilst this 10 x 12 shed may be beyond the budget of some people, it does deliver exceptional quality and durability, and for this reason it makes the upper reaches of our league table. Made of sustainable European softwood, it follows the traditional design often associated with large sheds. That means it has a narrow front, when compared to its depth, and an apex roof above it. We found this one of the more attractive examples though, thanks to the high quality of the smooth planed wood used. 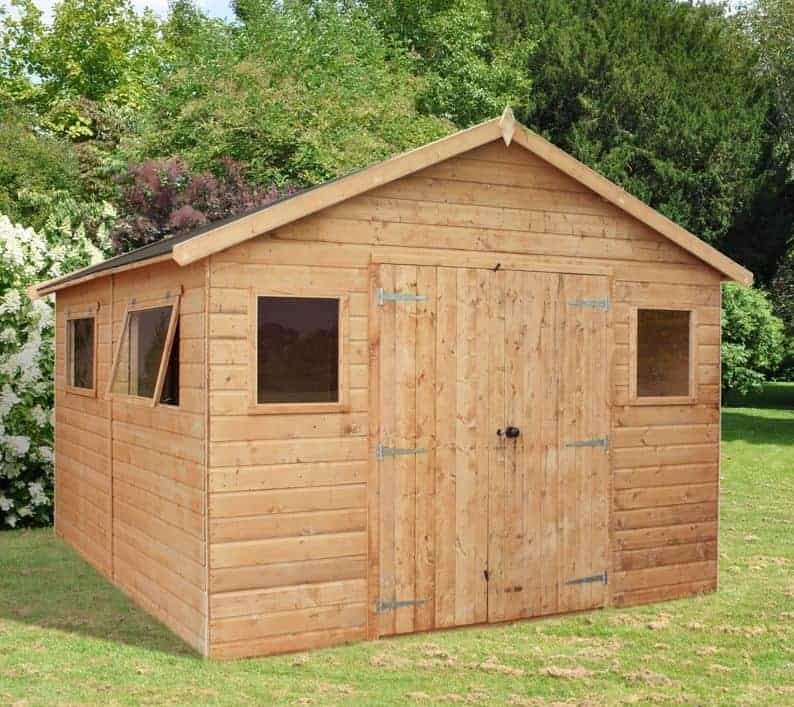 Quality is at the heart of all this shed’s features, as shown by the use of tightly interlocking tongue and groove throughout. There’s also a thicker than average frame to give it added core strength, which can come in particularly useful if it’s to be positioned in an exposed area. All of the timber has been pressure treated, which means that it comes with a 15 year guarantee against rot and also means that the customer themselves won’t need to retreat it every year, although we still recommend that annual inspections are carried out. 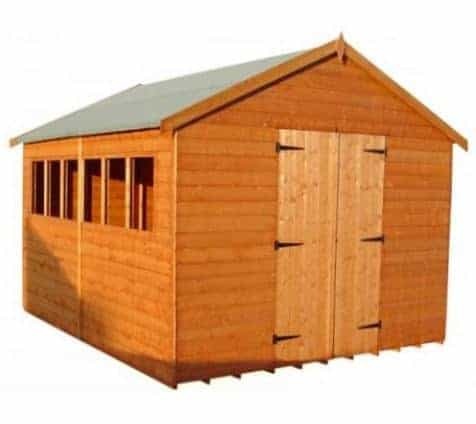 With double opening windows and a larger than usual single hinged door, complete with key operated lock, as well this is a great 10 x 12 shed even if not one of the cheapest. Large and well constructed timber sheds are ideal as workshops, as they typically allow more natural light inside than their metal counterparts and are cooler in hot summer temperatures as well. 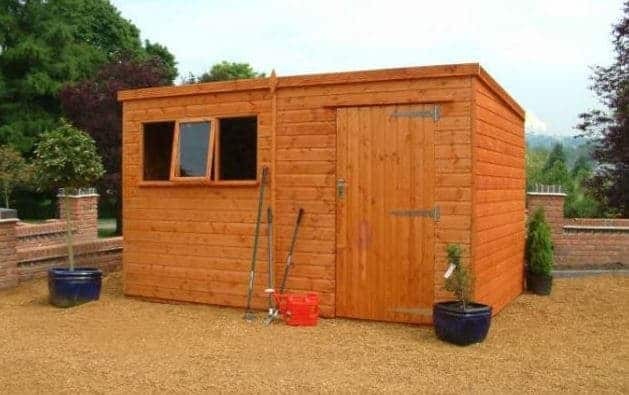 They are also often more expensive as well, of course, but this particular 10 x 12 shed can double as a perfect small scale workshop at a very affordable price. Shiplap cladding is used throughout, which is very good at keeping rainwater away as is the apex roof above it which reaches to a peak height of 2.56m. What we particularly liked about this cladding is that it is made from slow grown Baltic pine; this means that it’s thicker than most tongue and groove timber that we seem in this case 14mm for the wall cladding rather than the 12mm that we often see, and this creates a significantly stronger shed. There’s also a 10 year guarantee, although we would have liked to see an initial pressure treatment used to create an even longer warranty period. Another feature that impressed us were the full braced double doors which are secured with a rim lock, and with shatter resistant styrene glazing used for the two windows as well this is a very secure shed for the price. This is the first of the BillyOh sheds to make our 10 x 12 sheds list, and represents the top of their range model. 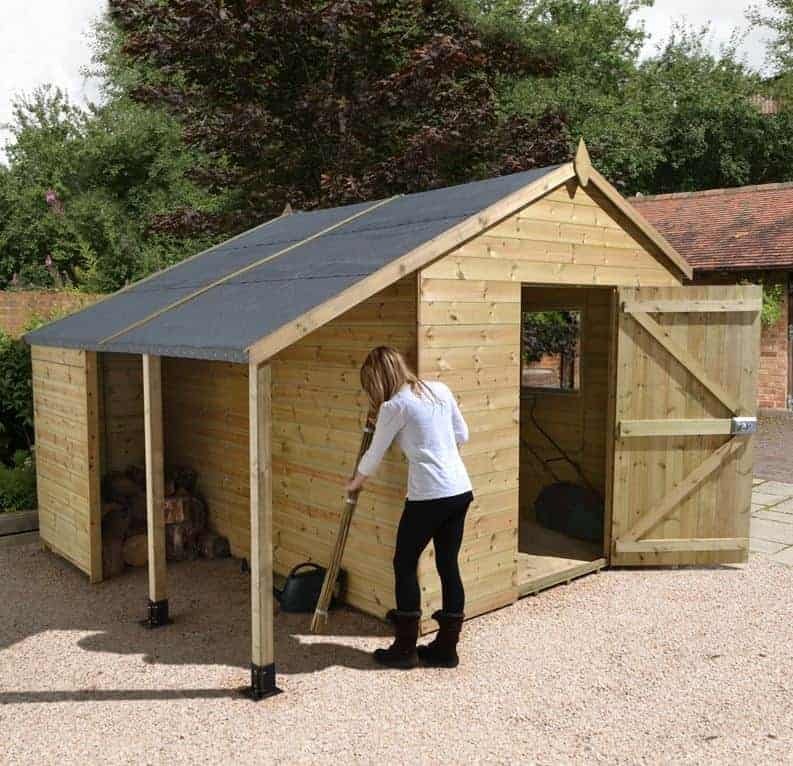 As such, with a price tag of well under a thousand pounds for a well built tongue and groove 10 x 12 shed, it represents very good value for money, but do remember that a floor will need to be added as an optional extra as well and this will cost upwards of a hundred pounds. This is the only reason that this shed doesn’t find itself higher up our league table, but it still has a lot to recommend it. One of the things we liked most about this 10 x 12 shed is that it has two sets of wide opening double doors, making it very easy to get in and out. 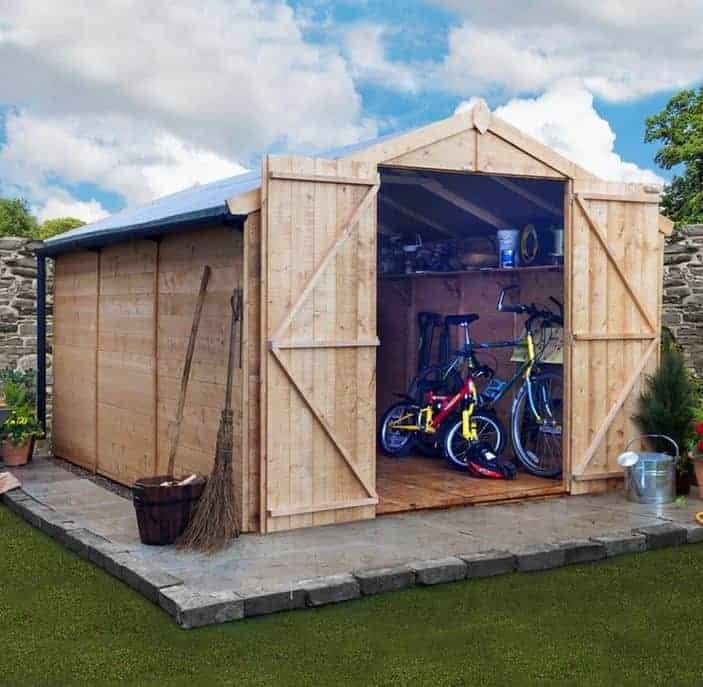 That also makes it easy to use the shed for dual purposes with one half, for example, being used as a storage or workshop space, and the other half as a home office. If anything valuable is going to kept inside, however, then a pair of padlocks would need to be purchased as well, but these needn’t be an expensive acquisition and the pad bolts are ready to accept them. We also liked the four opening windows with Georgian style hatching, meaning the interior can be both light and airy on a sunny day. 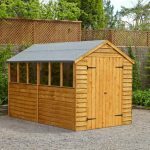 This Rhino 10 x 12 shed really deserves its name, as it’s one of the toughest garden buildings we’ve reviewed. It’s also one of the more expensive sheds in our league table, which along with the lack of an extended warranty is the thing which prevents it achieving a position at the very top. If you have a budget that will stretch to this price, and you want a large wooden shed that’s extremely durable then this could be your perfect purchase as long as you’re prepared to add an initial preservative treatment and continue that process on an annual basis. Being a pent shed this has slightly less height than most of the other timber sheds on this list, and yet there’s still enough room to move around in and you won’t need to duck when walking through the 1.88m high singled hinged door. What impressed us most was the thickness and strength of the tongue and groove cladding used. Its thickness of 22m, and the frame thickness of 50mm, are the thickest and therefore strongest that we’ve seen on a 10 x 12 shed and so as long as the treatment requirements are kept up this should prove to be a very durable garden building. This tough garden building from Arrow shows just how versatile a 10 x 12 shed can be. 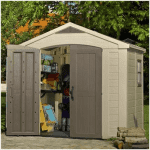 Not only can it be used as a very spacious garden shed for all your tools, equipment and more, or a craft workshop, with the right design it can also be used as a garage. The reason that this particularly shed is ideal for the storage of small to mid sized cars is that it has wide double sliding garage style doors, which dominates most of the front which is 3.50m wide. It has to be said that we would have liked to see a padlock included with a building designed to store vehicles but this can easily and cheaply be added. We were struck by the appearance of this 10 x 12 shed on first sight, with its starkly white PVC cladding only tempered by brown trim around the doors and the apex roof. We appreciate, however, that some people may find its appearance too plastic for their taste. Being made of plastic, however, it’s also fire resistant, which is ideal for storing not only a car but also motorcycles, ride on lawnmowers, or flammable liquids such as fuel or paints. 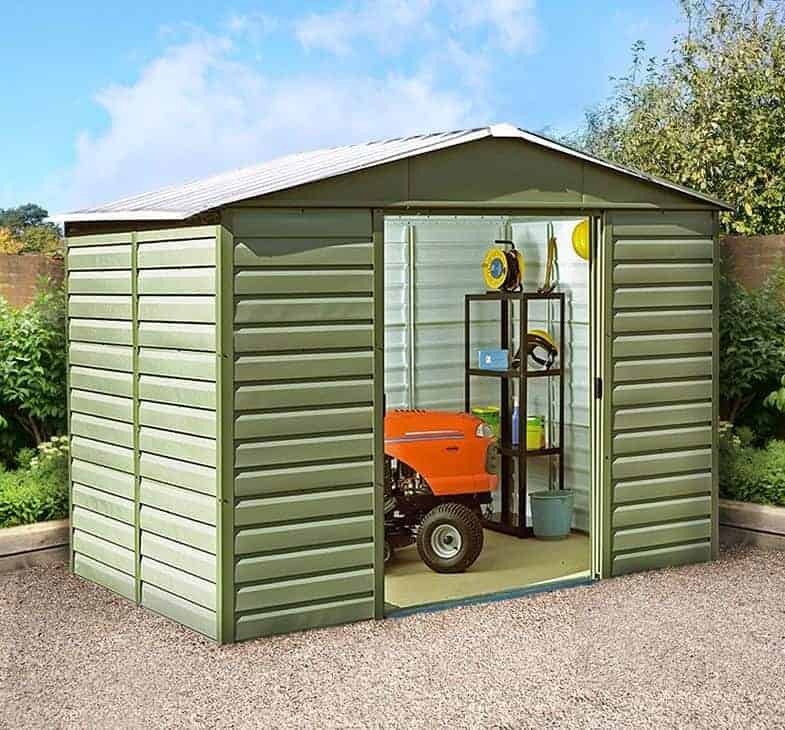 We feel the 10 year warranty provided could have been longer, but if you want a shed that can also be used as a compact garage this could be for you. We all hear stories of how shed crime is on the rise, and the larger a shed is the more of a target it can seem to opportune thieves. That’s why security is especially important for 10 x 12 sheds, and why we always recommend adding a padlock to sheds that don’t include a secure locking system as standard. This shed from BillyOh, however, boosts security in a different way. Its window free design means that thieves will have no way of knowing whether anything valuable is stored inside or not, and this means that they are more likely to pass it by in search of a shed that offers more obvious rewards. We liked the use of premium grade tongue and groove for the walls, and although solid sheet material is used for the apex roof it is then covered with a strong mineral felt. The result is a building that should prove very durable, although the 10 year warranty and use of an initial dip treatment means that the customer will have to retreat it themselves every year. We also liked the very accommodating double doors, which open to a width of 1.12m. 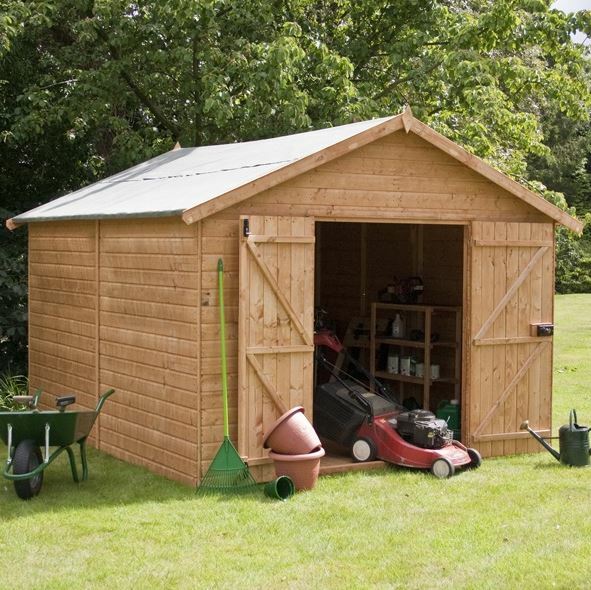 We feel then that this is a good choice for people who want a wooden 10 x 12 shed that’s both practical and secure. 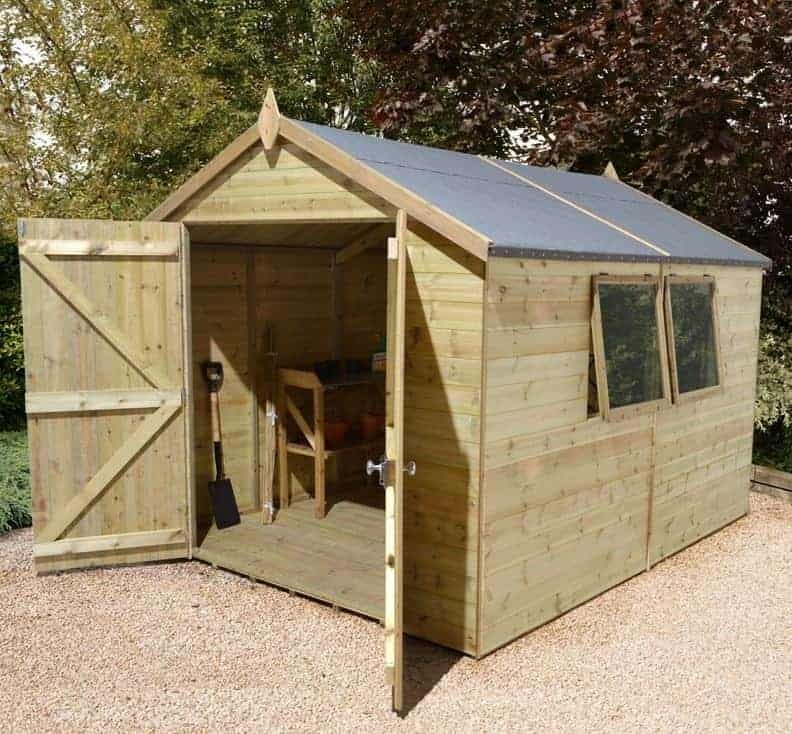 Added value is something that we always like to see, and that’s certainly what’s provided by Shed Republic here as they’ve taken a well constructed heavy duty 10 x 8 shed and added a very useful log store as well which is what gives you that overall, 12 x 10 space you want. This is made possible by the overhanging apex roof which in effect creates a wooden canopy that adds an extra three foot to the building. The rear section is enclosed by a timber wall with an open front, and this makes it perfect for the storing of logs which need to be kept dry and well ventilated if they’re to burn to their full potential. Another feature we liked is that 12mm tongue and groove cladding has been used across the entirety of this 10 x 8 shed, and not just for the walls as we sometimes see on the wooden sheds we review. A pressure treatment has been applied to this timber as well, giving it a 15 year guarantee against rot. Another reassuring feature is the use of toughened glass for the two windows, which again is not something which we always find used. It costs more than many of the other timber sheds on this list, which accounts for its relatively low position in our list, but for those with a log burning stove it could still represent very good value for money. The larger a garden building is, the more important it is that it has a tough frame that can give it the strength it needs to withstand the strong winds that seem to becoming more prevalent in our climate. That’s why we always like to see a 10 x 12 shed, such as this one, that has a heavy duty frame to go alongside strong tongue and groove cladding. The frame itself is 44 x 44mm, which is in excess of that which we normally see on timber sheds of this size, and there is also cross framing to give it added strength and stability. We also liked the inclusion of pressure treated floor bearers to give protection from ground moisture rising up from below. It’s not just the floor bearers that have been pressure treated, as we were pleased to see that this had been applied to the timbers in their entirety. This long lasting treatment also means that the shed comes with a 15 year warranty, and that it won’t need to be retreated with wood preserver every year. 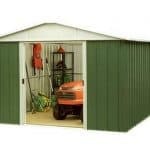 With wide double doors that have a key operated lock as standard included as well, this is a 10 x 12 shed that would have been placed much higher if not for its asking price. This is the second timber 10 x 12 shed on our list of the top 20 which has a window free design, and once again this is a sure fire way of preventing prying eyes from seeing anything valuable that might be kept inside. It does mean that an artificial light source will need to be installed if you plan to use it as a workshop, but the wide opening doors allow plenty of natural light into the shed when opened, making it easy to find and retrieve items from within. One advantage that this particular 10 x 12 shed has over the windowless model from BillyOh that we looked at earlier is that it has an integrated tongue and groove floor. It’s also, however, considerably more expensive and we’ve had to take this into account when determining its final position in this WhatShed league table. It has many additional features that we really welcomed, alongside the 10 year manufacturer’s warranty against rot which is fast becoming standard, from the secure key operated locking system to the use of planed and rounded framing to give extra strength, so this could be a wise choice for people who have security as their main concern when it comes to purchasing a garden building. The vast majority of the 10 x 12 sheds that we review, whether made of timber, metal, or plastic, feature an apex roof that quickly carries rainwater away. This particular model,however, features a reverse apex design. This means that it still provides the same benefits when it comes to water repellency, but it’s wider than it is deep and this makes the shed ideal for people whose garden is relatively shallow. It also gives this shed a unique appearance, although it still adheres to the traditional style that so many people love. The first thing that we noticed besides the roof’s reverse apex was that the front façade is dominated by the double hinged doors at one end and two opening windows at the other end. This not only makes it very easy to move wide or bulky objects in and out it also means that there’s lots of light in what feels like a very pleasant interior. Once again we were pleased to find a key operated lock included as standard, and strong tongue and groove cladding that comes with a 15 year guarantee. 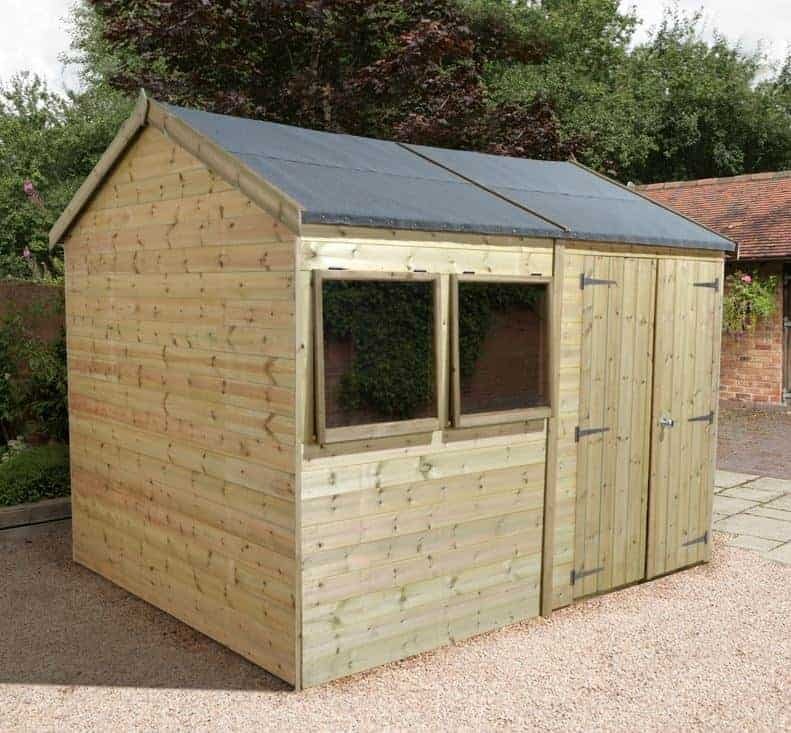 If you don’t mind paying a little over sixteen hundred pounds for a durable and tough 10 x 12 shed, then this should certainly be given your consideration. Large timber sheds typically cost more than similar sized buildings made of metal, but many people prefer the traditional look that a wooden shed brings to their garden. 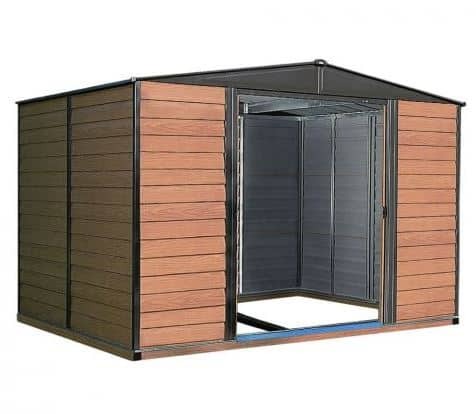 For those looking for a 10 x 12 shed made out of timber, and yet who are operating on a tight budget, help is at hand thanks to this very affordable shed from BillyOh. It features overlap cladding, which whilst not as tough as the tongue and groove cladding that we usually see, creates a very rustic appearance. The cladding is still very good at keeping rainwater out, with the help of the apex roof above it, and as its been given an initial dip treatment by the manufacturer it comes with a 10 year anti-rot guarantee. This guarantee is dependent upon the customer carrying out annual retreatments, but it’s worth pointing out that rough sawn timbers such as these can also be easier to treat than their smooth planed alternatives. There are two fixed windows as standard, but the floor is once again an optional extra as we expect with BillyOh sheds. 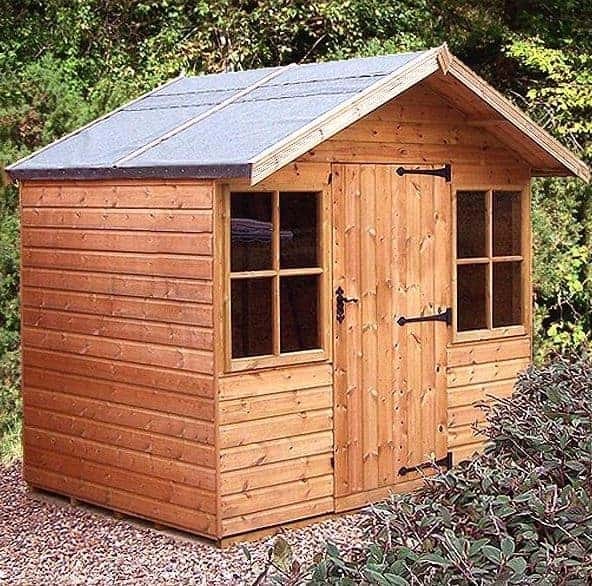 This may not be the most sophisticated 10 x 12 shed in our top 20 list, but it earns its place by offering a low cost alternative to other wooden sheds. The first thing that struck us upon seeing this tongue and groove 10 x 12 shed was the large double doors that sit in the centre of the front face. Fully braced to give them extra strength they have an opening width of 1.33m and an opening height of 1.77m. 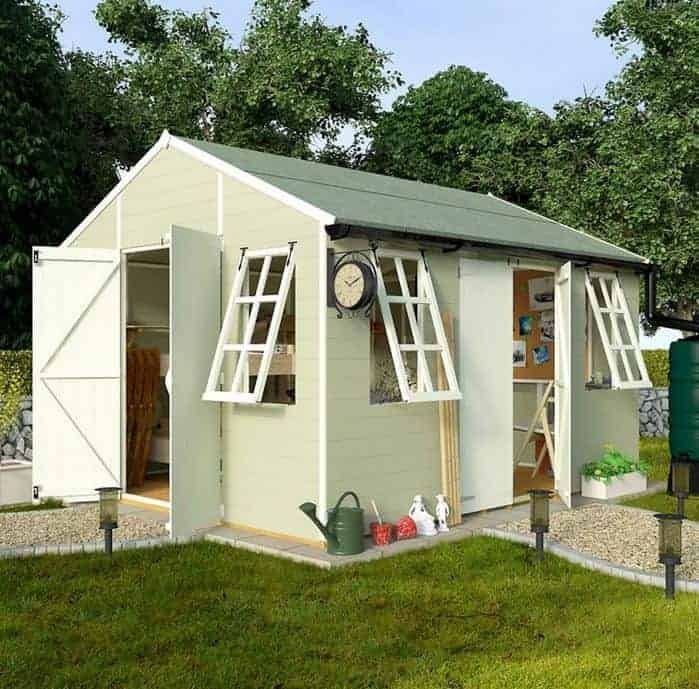 This means that it’s easy to move large objects such as furniture and machinery inside, which is one of the reasons that we feel this shed would be ideal as a workshop for a hobby or even for a small scale business operated from home. Another essential feature for a workshop are windows, so we were pleased to see that this shed includes eight windows that allow natural light into every corner, with some of them opening as well to provide fresh air whenever required. We were also impressed by the key operated lock included as standard, showing that the manufacturer takes the security of their buildings seriously. 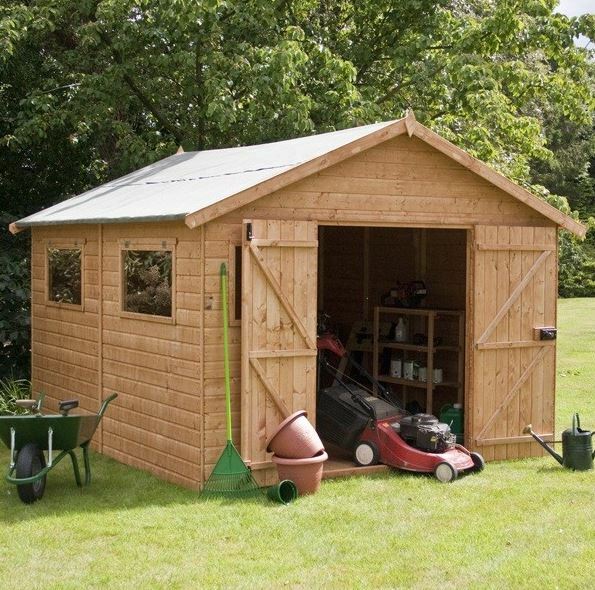 The only thing preventing a higher placing for this 10 x 12 shed is the dip treatment that gives only a 10 year warranty against rot, but if you don’t mind applying annual coats of wood preserver yourself then this is a well constructed wooden shed that’s worth considering for your garden. There are few garden buildings that look more traditional than a timber pent shed, and this is an excellent example of what they have to offer. It’s not as ostentatious as an apex roofed shed and yet because the pitch of this roof is relatively shallow it still offers an eaves height of 2.00m. This means that it actually feels very spacious inside and yet it may also be possible to hide this 10 x 12 shed out of sight behind a tall fence or wall, thus improving its security by keeping it out of sight of passers by. What impressed us most about this pent shed is that it’s very tough and stable, and this is largely thanks to its 50mm framing and the use of diagonal cross framing to provide additional structural support where it’s needed most. There’s also a three lever security lock, which is the best that we’ve seen on a 10 x 12 shed of any kind, although it may be worth taking the option of upgrading the three windows to toughened safety glass if you want to have a shed or workshop that’s secure enough to keep valuable items and machinery inside. Overall, we were very impressed by this shed and it’s only the lack of an extended warranty that prevents it being placed in the top half of our guide to the best 10 x 12 sheds. This is probably the most attractive plastic 10 x 12 shed we’ve seen in a size category dominated by metal and timber buildings. Its PVC cladding is finished in a white and pale blue design that really caught our eyes and we really liked the canopy provided by the overhanging roof. That creates a very useful shaded area on sunny days, and we can easily imagine it being used for barbecues. Another welcome feature was the inclusion of two windows as well as glazed panels in the double hinged doors. PVC cladding is an ideal substrate for a larger shed as being ready painted maintenance free it means the owner won’t have to spend time or money retreating it every year. It’s a very durable substrate, and of course is free from concerns about rot, rust, insect or rodent attack, and as the PVC cladding used on this particular shed is particularly thick at 26mm we would expect it to last many years, possibly decades, without any problems occurring. 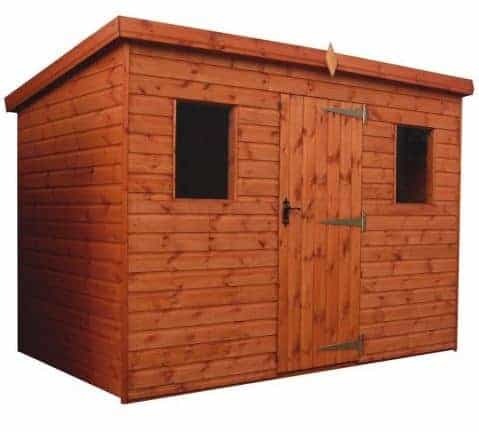 It’s a pity then that this is one of the few timber 10 x 12 sheds we’ve reviewed that doesn’t come with any extended warranty at all, and this combined with the asking price of more than two thousand pounds accounts for its position near the foot of our league table. From first sight we could tell that we were looking at a very high quality 10 x 12 shed here, with smooth tongue and groove cladding being complemented by ornate and heavy duty hinges and a tough three lever lock. We also liked the two large Georgian style windows on either side of the single door, which we were pleased to find contain toughened glass, and this means that there’s a lot of light inside the shed for people who want to use it for craft or hobby purposes. The differentiating feature about this wooden shed when compared to the others in our top 20 list is that the apex roof projects to form a canopy and a natural verandah underneath it. This is not only an attractive feature, it’s also very practical as it provides extra weather protection against both rain and the sun. There are various options that the customer can opt in to at the time of purchase, such as adding floor bearers or upgrading to opening rather than fixed windows. We always welcome ways to customise a 10 x 12 shed, but at the high asking price here we would have expected to see many of the options included as standard as well as an initial pressure treatment and a long extended warranty.